If you’re not familiar by now with the “SCHWARZ-EFFECT” let me enlighten you…it’s a mixed blessing or curse depending on how you look at it! In a nutshell, just about whatever topic Chris Schwarz brings to light there is a sudden, and usually massive, rush of interest in it from the masses of woodworkers following his writings. 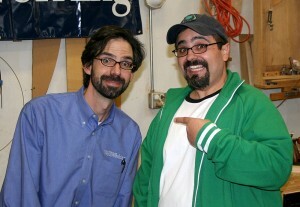 For example, back in 2010 Chris was presenting a discussion on scraper planes at Woodworking in America. I immediately went out and bought both a Veritas Cabinet Scraper and Scraper Plane from Lee Valley because I wanted to be prepared for all the scraping goodness they would be adding to my woodworking experience. I learned a lot of great information about the tools, but more importantly I learned a bigger lesson in speculative trading! Rather than buying tools for the discussion, what I should’ve been doing was buying up used Cabinet Scrapers and Scraper Planes to sell to my fellow woodworkers in the hours and days following the conference. In a very short time, the price of these tools on auction sites like eBay started skyrocketing as the demand increased. It’s crazy how fast it happens and how long-term the effect is! And by long-term, I mean LONG-TERM!!! Another great example is the Schwarz-effect on the discussion of workbenches. Here it is 2013 and his “Workbenches” book hit the market in 2007. Now that I’m finally getting serious about building my last workbench it’s the resource I went to first and it’s also the resource SO MANY of my friends online recommend. Don’t get me wrong, I’m not lamenting the “Schwarz-effect”! Instead I’m going to simply embrace it for what it is, a force for woodworking goodness that will eventual take a toll on my wallet (but at least this kind of toll on my wallet has its benefits, unlike strippers and knitting). If you’re ready to embrace the “Schwarz-effect” one resource I’ll highly recommend you consider bringing into your shop is to pick up the Chris Schwarz Ultimate Digital Collection, Volume 2 at Shopwoodworking.com. The Schwarz blogged about the Stanley #80 scraper, and I couldn’t get one for a year.. The man knows his stuff. No doubt about that. All hail the Schwarz!! Resistance is futile. I know what you mean. After reading the Anarchist Toolchest and watching the accompanying video I just had to have a vintage Stanley #5 Jack plane. It was darn near impossible for awhile but finally found a rusty one for $18, reworked it and now love it. I met Chris at Highland Woodworking awhile back. He was showing his new toolchest. Someone asked about the antique lock hardware. He said you can get them on ebay all day for $5. We all laughed because we knew that he spoke, prices soar.